There is a wide range of options from all corners of the globe at the six counters at De Refter. With Meet the World, we take a step further. Students and staff members of Radboud University from all parts of the world will be serving up their favourite dishes. Did you like what you ate? Take the recipe with you, so you can make it at home. The recipes and stories behind them will be announced soon. Refter Opening Week: There will be activities and promotions the entire week of 25 – 29 March, so you can come get a glimpse of our new space and a taste of the food. Verspreid over de 6 counters vind je in de Refter een breed assortiment uit alle windstreken. Met Meet the World gaan we nog een stapje verder. Studenten en medewerkers van de Radboud Universiteit bieden hun eigen favoriete gerecht aan. Deze gerechten, en de verhalen erachter, maken we hier binnenkort bekend. Actie: Korting op Meet the World gerechten. 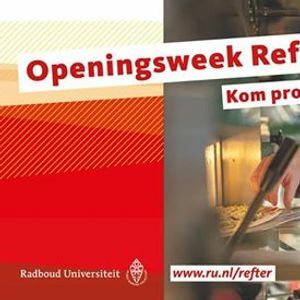 Openingsweek Refter: Van 25 – 29 maart zijn er activiteiten en kortingsacties in de Refter. Zo kun je uitgebreid de sfeer en het nieuwe assortiment proeven. HotShots! groovin' Easter Jazz 2019! Brothers of Mercy - Enge Buren 80-ties Tribute.